Here in Colorado we love the outdoors, we love exercise, and we love our 5k runs. Spring, summer, and fall are all a part of the long 5K season. For experienced runners, a 5K is a chance to run hard and fast, but if you’ve never done a 5K, it may seem a bit intimidating. Eat a well balanced meal including lean protein and healthy carbs. Think chicken or fish with whole grains. Drink plenty of water so that you are hydrated right away. Don’t participate in high intensity exercise before the big day to prevent soreness. Sore legs running 3.14 miles will only make the run seem that much harder. Stretch or use a foam roller! Take your time and really stretch it all out. Lay out your clothes and make sure your race packet is in order. This will give you more time to relax and mentally prepare in the morning for the race ahead. Eat a mixture of slow digesting and quick digesting carbs 1-2 hours before the race. Avoid dairy, too much fiber or anything too acidic like orange juice. Ashley’s favorite pre-race breakfast includes whole grain toast with peanut butter, bananas, and honey. Make one last bathroom trip, even if you don’t have to go. Calm your nerves with a few big inhales and exhales. Envision yourself crossing the finish line. Refuel your electrolytes if its a hot summer day. Rehydrate appropriately. Drinking coconut water, having a few slices of watermelon, or eating a banana will help refuel your potassium levels. Eat a high protein lunch to help aid in muscle recovery. Soreness can often be attributed to a lack of adequate protein. Don’t forget to stretch post-race to prevent injuries. Looking to test your mettle? 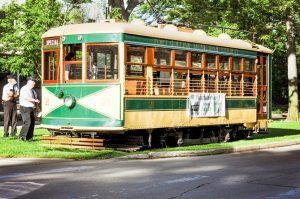 The Fort Collins Human Race, where runners race the Trolley Car on Mountain Ave. is being held Saturday, July 30th in Old Town Fort Collins and Raintree is the presenting sponsor. In the unique Man vs Machine challenge, runners toe the line with historic Trolley Car 21, racing through the course to see who’s faster – Man or Machine. Think you’re faster than the trolley? Sign up to see if you will go home with the special bragging rights t-shirt. Even if this is your first race, we challenge you to beat the machine using the tips above. Are you in?